Criteria is suppose to be 150, as of right now it says 100. So far no new mount for it but I'm assuming there will be one added later on. Don't hang me up on it but as of what has been datamined it might be a kite or a "windsteed" whatever that is. The mount associated with this achievement has been confirmed to be a Jade Pandaran Kite in the Patch 5.1 PTR - Build 16257 notes. Screenshots of the mount can be found on the respective page. 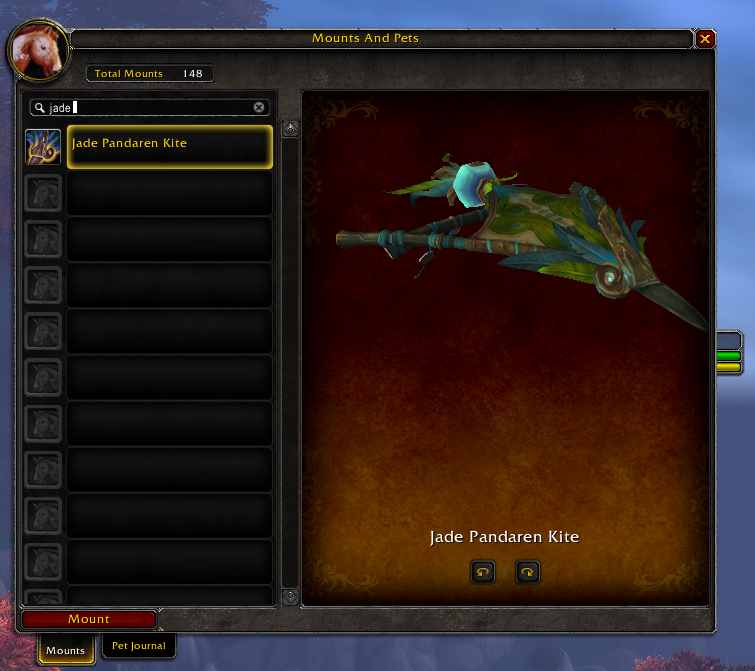 This Achievement first became available on 11/27/2012 with the release of 5.1 and awards Jade Pandaren Kite String. A complete and thorough guide has been created for this achievement. If you don't get the mount on triggering this, simply make a new character, login and back out, and then delete it. It should then appear in your journal! I have noticed that if you have the DK/Warlock/Pally only mounts on one character, although you can't see it on other classes it still counts towards mount achievements (check in statistics on the ach tab for mount total). Therefore if you have a warlock, paladin and DK with their 7 exclusive mounts then you will hit the 50 mount ach when you have 43 other mounts etc. This DOESN'T work for racial mounts you have on the opposing faction but may count the Paladin elekks if you have both a human/dwarf paladin and a Draenei paladin. Following the achievement picture I thought it would be another type of Cloud Serpent... but it's a Kite instead. Meh. This achievement is currently bugged according to in-game Customer Support > Knowledge Base > Top Issues and has been for a good few days at least. I'm getting close to the 150 mounts so hope they fix it ASAP. For anyone wondering, if you have 145-148 mounts on a character without any class mounts, the mounts which warlocks, death knights and paladins get DOES count towards this achievement. On the release of patch 5.1 had 147 mounts on my rogue, logged him and got the achievement. I've got a warlock and a paladin, and i did not even need to log them for their class mounts to count towards my achievement. It should be noted that ALL mounts on ALL characters on ALL FACTIONS (i.e. Alliance and Horde) are counted in the total count. If your main is an Alliance toon you can hop on a Horde toon, get it exalted in the Horde factions, get the Horde mounts and have mounts left over to spare after you get your 250 mounts. I just got mine today. I had 148 mounts, and had a friend make me 2 of the JC panther mounts. Still 148. Bought the yaks at one-keg, still 148. Found out I didn't have the Tushi Panda mounts from SW, bought those, and boom, Achievement. Wish I'd have known about those sooner, it'd have saved me about 50k. You've collected 150 pokemon mounts! Here, have this diploma kite! For people that is starting to play wow, its is really dificult to get mounts without a great guild, even more those mounts that you get doing achievements in wotlk. Good luck to all those that are going to start doing this achievement. Keep an eye on the mount count as you add new mounts. If you are having an issue with the mount count for the achievement not going up try logging onto your toons that have class specific mounts and use them. I just added two mounts to my collection and the mount count for the achievement didn't go up at all. A light bulb came on in my brain and I logged onto my DK and used the Deathcharger and then my Pally and used the Warhorse and the count went up by two. Hope this helps someone. Quick way to get Racial mounts, if you have a level 55+ character. Create a DK of whichever race you need on a random server, level to 60, farm enough gold to buy each one. Worgen and Goblins only get 2, but others should get six each. I believe that's a total of 32 mounts. So close to getting the mount! 20 mounts to go! It's kinda silly that some racial mounts don't count towards this. A mount is a mount, if you don't have it on your account it should count. So my issue here happens to be that I have a total of 166 mounts in my mount journal, but have NOT acquired the mount or achievement so far and I was just wondering why. Is this a known problem or issue? Is it something that came out in 6.0.2? Even though it shows my Horde mounts as well as Alliance, is the faction you are using the only mounts that count? Any help/info would be greatly appreciated. Thanks for taking the time to contact us about your in-game issue. The issue you reported is either something we are not able to assist with, or we are unable to verify that all of the criteria were met. At this time, we are not able to assist with granting progress or completion. I’d recommend checking out the criteria on one of our database fan-sites, such as ( www.Wowhead.com ). The comments section has a lot of helpful tips and information from other players, that can often times help clarify any missing details. I’m very sorry that we are not able to directly assist here, but I wish you the best of luck. If you have further questions about this, please let us know. Otherwise, we thank you for your patience and hope you have a good rest of the day (and New Year).​"
As of patch 6.0, your Mount Journal will contain all collected mounts from both factions. However the achievement is tracked differently and only counts the mounts that your currently logged in character can use. Therefore do not go by the number in your journal, but rather the number that the achievement says - found under Achievements\ Collections\ Mounts. That being said, the number can lie (in a sense). Here's an example. I have an alliance monk with 113 mounts in the achievement tracker. I log off and log onto my horde paladin on another server. The two pally mounts take the sum up to 115 total on the tracker. Log off and back over onto my monk. My monk now says he has 115 mounts. I buy two goats from the Tillers. Still says I have 115 goats. See the problem? If you want the most accurate number in the achievement tracker, log onto the character that would logically have access to the very most. This is unfortunately awkward if you are collecting mounts on a main character on another server than the one who has the most mounts. However, I have heard that the tracker will give you the achievement for 150 if it can figure out that you would have 150 on any given character. Back to my example. If I have 147 on my monk and gain one more to 148, I would likely get the achievement immediately without having to switch characters. This is Game Master ********* at your service. I appreciate you taking the time to get in touch with us! I have a quick update for you about the "We're Going to Need More Saddles" achievement. So right now I can see that on ********* you've got 101 mounts counted towards the achievement. I can see why you'd be concerned about this sort of thing! You seem to be aware that not every mount counts towards the overall total displayed for the achievement, but it's also good to keep in mind that there may be some other mounts that don't count towards the achievement. Because there are hundreds of them in the game we do not have a comprehensive list of ones that do or don't count, but I can say that we've seen issues with the achievement not updating in a timely manner. This would be especially true if you've learned a bunch of mounts over the last week. To our knowledge there wouldn't be anything "broken" with the achievement or your character; it's just that in many instances the tracking is a bit sluggish. *Submit a bug report directly through the in-game interface by opening up the help menu. You won't get a response back from our developers but it can help to identify any issues that might require their attention. *You could also contact us with the details and we can forward up our own report. Once again, this would not guarantee a response or a "fix", but we can help to attack any discrepancies from both angles this way. So evidently not all mounts count towards the achievement. Hopefully they get it to where all MOUNTS count towards the MOUNT achievement. Hope this helps some people understand why their mounts aren't all counted. The overall total mount listing will count Alliance and Horde specific mounts into your over-all count in the Mounts Tab which will make the number significantly higher if you are active on both sides. Additionally, mounts that require a specific class (paladin, death knight, warlock) or a specific profession (tailoring rugs and the like) also will count in the Mount Tab, but if your character can't use it, it will not count towards the achievement. In addition, if you have the achievement for Warlord's Deathwheel, (meaning that you logged into WoW during the period of 24 July 2014 to 30 Sept 2014) then your Horde Characters will have one additional mount, the Warlord's Deathwheel. Thus, be sure to check the achievement progress on the character that can ride the most mounts on your account. They count mounts on the character, so when you are alliance, it does not count in the horde mounts. Same with class specific mounts or not counted on other classes. The journal with mounts which shows you your total mounts, are therefore not an indication on how far you are on this achievement. Okay, so I recently contacted a GM about the mount collecting achievements because I figured. "Hey, I main Alliance, if I get a bunch of Horde mounts, that'll really help my total!" After grinding Argent Tournament dailies into the ground, it turned out I was wrong. After some confusion about what exactly counted towards the total the GM told me why in an incredibly well detailed explanation that I haven't seen anywhere else. So hopefully it will be of some help to everyone else as well as a possible be-all-end-all answer to everyone's questions. I'll copy and paste the message here for your viewing. The main confusion we have been seeing with these mount collection achievements, is that the in game mount counter is going to show you both faction's mounts. However the achievement can only be completed on one faction or another because its faction specific. Faction-specific means the Alliance version counts Alliance mounts + Neutral mounts and the Horde version counts Horde mounts + Neutral mounts. So if you have a bunch of Alliance mounts and a bunch of Horde mounts, they are separate for counting in the achievement. For example, players can't buy up all of the Horde mounts and buy a couple of Alliance ones to equal 100. Faction mounts cancel each other out between Horde and Alliance as far as mount achieves are concerned. i.e. if someone already had the two Goblin mounts, getting the Worgen mounts did not count as extra mounts towards the achievement. So players only need to focus on one side or the other (Horde, or Alliance), because purchasing mounts from both sides will not count for the achievements together. Class specific mounts also do not count. So to get a more accurate count for either faction, you can track the achievement itself or go into achievements>collections>mounts and see the progress toward the achievement on that specific faction. However keep in mind that it can also be a bit off because if you are on an Alli toon, it will show the highest mount count across all Alliance toons, but not necessarily the Alliance toon you're on, and any class mounts might make the count a bit different on the characters with those class mounts. Additionally, PVP mounts are mostly not account wide. So those mounts will only count on the characters they are earned on. Class mounts also only count for the character they are on and do not stack across the whole account. Lock mounts, paladin mount etc. don't add on each other. For example, if you have 98 mounts on a mage, and a paladin you might have has 3 class mounts, you will get the achievement when you log into the paladin and not the mage. Those 3 paladin mounts will not stack with other class mounts like lock mounts etc. I hope this information helps and I wish you very happy hunting from here! So there we have it, the achievement is faction specific, certain pvp mounts (I assume vicious saddles) do not count, class mounts don't count, and profession mounts count only if it's usable by the character I assume. Also props to GM Trowarves for being super helpful! While there are many comments and threads about mount collecting achievements, I would like to make clear a few things since they are still debatable. There are many mounts (mostly main cities/racial mounts) that have a counterpart in the opposite faction. That means that in your collection tab will be added 2 mounts but actually in your achievement tracker will be added 1 mount (since a specific character can use 1 additional mount, not 2). There are some profession mounts that can craft/learn/ride only while you own a specific profession BUT ONCE YOU LEARN THEM THEY ARE COUNTING ON ALL OF YOUR TOONS. That mean that it doesnt mater if you learn them in you main/alt and you can even delete this profession once you learn these mounts. That means that every new class hall mount that you learn in a new class (using your alts) is counting as a '+1' in your achievement. That makes Paladins the holders of the highest possible number in the game. Theorytically speaking, you dont even need Demon Hunter's Felsaber as you can see. THIS MOUNT NEED TO BE OBTAINED ON EACH TOON INDIVIDUALLY. Its CRUSIAL to obtain this mount on your PALADIN in order to get the highest possible number because if you don't, your paladin will got 1 less mount than the higher possible number. If the starting quest is not available for you, make sure to complete the attunement quests of Broken Isles / Argus / Kul TIras or Zandalar, then the quest will be available for you. Keep in mind that the achievement tracker counts each time you log in with a toon. At this Point your Paladin will be +2 mounts that anyother toon (if this toon got Vashj'ir Seahorse ) otherwise will be +3. Obtain 150 mounts (usable by a single character).